As industrial processes and applications have matured, industry organizations have developed unique classifications and specifications for the pipe destined for service in those sectors. There’s lots of overlap among the organizations’ published specs, and likely lots of confusion as well. Buyers can improve their purchasing experience by learning more about how grades of steel are designated for piping and by understanding all the information that should be included on a purchase order. Both the American Society of Testing and Methods (ASTM) and the American Society of Mechanical Engineers (ASME) publish piping specs. 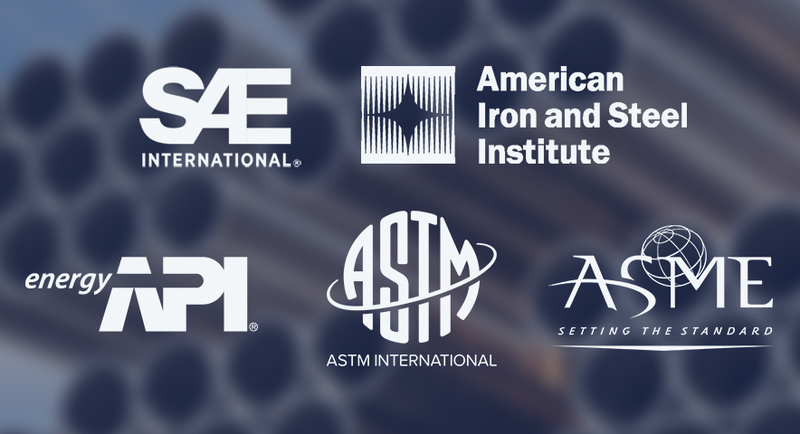 ASTM and ASME pipe designations for grades of steel are very similar. For example, A106 B is a spec published by ASTM (the ASME spec would be SA106 B). The “A” designates a ferrous material. ‘106’ is an arbitrary number that designates it as a seamless carbon steel pipe suited for high-temperature service. Then, grades (such as A, B or C) are assigned that indicate certain characteristics of the steel based on differences in its chemical makeup and mechanical properties. Pipe sizes are described by using a pipe chart (ANSI/ASME B36.10 and API5L) that includes the outside diameter and wall thickness. The outside diameter can be referred by the nominal pipe size (NPS) or the actual dimension in inches and the wall by stating the schedule or the actual thickness in inches. Note that while ASTM and ASME specs are largely identical, an important difference is that pipe meant for use in pressure systems sometimes requires different or additional quality tests before it complies with the ASME standard. American Piping Products stocks a full range of A/SA106 and A/SA 53 carbon steel pipe. The American Iron and Steel Institute (AISI) and the Society of Automotive Engineers (SAE) share a numbering system to classify steels. AISI/SAE designations only describe the chemical makeup of a steel. They do not include manufacturing, heat treating or testing information. Using 1020 steel as an example, the first digit expresses the steel as a plain carbon steel. The second digit indicates there are no added alloys. The last two digits indicate the steel has around 0.20 percent carbon content. For another example, a popular steel in the piping industry is 4130. The ’41’ indicates the steel contains chromium and molybdenum alloys. The ’30’ indicates the steel has around 0.30 percent carbon content. Again, AISI/SAE designations only classify steels. For example, a buyer who says, “I need 100 feet of 4130” has not provided enough information. The buyer also needs to note specific production and testing information found in an ASTM or ASME spec to get exactly the pipe they need. Pipe for use in the oil & gas industry are classified by the American Petroleum Institute’s (API) system. API 5L is the most common standard to which line pipe in the oil and natural gas industry is rated. Because that’s merely a standard, additional information is needed to ensure purchase orders are executed accurately. API 5L pipe is broken down into PSL1 and PSL2 delivery conditions; those conditions are further broken down into pipe grades, i.e. Grade B, X42, X52, X65, etc. Buyers should include the combination of the overarching standard, the delivery condition and the grade for the API5L pipe they need. What manufacturer restrictions are in place that may impact your order? Are there any origin restrictions that you need to follow when buying? What pipe lengths and end finishes do you need? Are there specific chemistry requirements needed for the application? Are there age restrictions that may impact your order for export? Suppliers need detailed purchase orders to ensure you get the right pipe the first time. That’s why American Piping Products trains its experts to ask detailed questions to ensure you identify exactly what you need across all grades of steel and applications. Download our product catalog to see what we have in stock, and use this in-depth buyer’s guide as a resource as you consider any upcoming purchases. Getting the right pipe starts here.